It is often the norm that hunters, security and surveillance experts, and law enforcement people perform the bulk of their activities during the day, and therefore require riflescopes that get the job done in broad day light. But when the exigencies of the trade require some night action, it’s equally important to have scopes that can perform very effectively in darkness. The makers of the RS64 Thermal Night Vision Riflescope know this too well and have developed a scope just for that purpose (night time action). In this FLIR Systems RS64 1.1-9x Thermal Night Vision Riflescope Review, we explore the product’s many features, its pros and cons as well as some of customers’ most frequently asked questions (FAQs) with the view to helping you make a thought-out purchase. 1.11.1 Q. Who are the manufacturers of FLIR Systems RS64 Night Vision Thermal Riflescope? 1.11.2 Q. Is the riflescope impact-resistant? 1.11.3 Q. What colors can I purchase the RS64 Night Vision Thermal Riflescope in? 1.11.4 Q. What are the colors of the reticles of the RS64 Night Vision Thermal Riflescope? 1.11.5 Q. Does the riflescope come with a case for holding it? 1.11.6 Q. Does the riflescope come with a lanyard? 1.11.7 Q. What is the weight of the riflescope? 1.11.8 Q. Does the riflescope come with a warranty? 1.11.9 Q. What are the dimensions of the riflescope? 1.11.10 Q. What’s the battery run time of the riflescope? 1.11.11 Q. Does the riflescope come with an external power supply cable? 1.11.12 Q. What is the frame rate of the riflescope? The scope’s multiple reticles, namely Duplex, Fine Duplex and German, allow you to view your target with precision. Furthermore, this combination of reticles makes it possible to aim at moving objects also. The RS64 1.1-9x Thermal Night Vision Riflescope is compatible with the Picatinny Rail Weapon Interface. Since a lot of weapons use this interface, it means that you can use the scope with a wide variety of weapons. The Scope’s user interface is extremely friendly with only Four Buttons. You can now say goodbye to problems that arise from pressing the wrong buttons. Certain scopes come with a passive LCD screen, which requires a tremendous amount of background light in order to form an image. Fortunately, the active matrix LCD technology of the RS64 riflescope requires little background light. This means that the scope can be used in the night and in areas that have little background light. The active matrix technology is also beneficial for the eyes because you won’t have to strain them to view anymore. While the RS64 Night Vision Scope doesn’t come with an external battery pack, it’s very compatible with it. Therefore, with an extra battery, you can power the scope when its internal battery runs down. Also, the scope’s internal battery is designed to last for 4 hours before a recharge is needed. The scope’s 3-inch eye relief is closer to the longest you can find for optical riflescopes (4 inches). Usually, after you take a shot at your target, the rifle uses some room to recoil, and this can cause very painful cuts above your shooting eye when you are hit. Therefore, the eye relief gives you room to recoil also. The FLIR Systems RS64 Night Vision Riflescope comes with a 35mm lens. A lens that has a focal length of 35mm is very similar to the focal composition of the human eye. Such a lens also allows you to view your target at a wide angle. It is very good for night hunting. It has internal and rechargeable Li-Ion battery. The device has a user friendly interface. It has a pretty long battery life (4 hours). You get value for money when you purchase this device. It comes with wall charger. It is compatible with a wide range of weapons. It neither comes with a carrying case nor a lanyard. The riflescope comes in only one color, black. It has a low frame rate of 30Hz. Q. Who are the manufacturers of FLIR Systems RS64 Night Vision Thermal Riflescope? A. The RS64 Night Vision Thermal Riflescope is manufactured by FLIR Systems, which is a company based in Oregon. Founded in 1978, FLIR Systems is the world’s largest designers and producers of thermal imaging cameras, components, and imaging sensors. The company’s R-series is the world’s premier line of thermal riflescopes for non-gaming hunts. Q. Is the riflescope impact-resistant? A. Yes, the scope’s body is impact-resistant. Q. What colors can I purchase the RS64 Night Vision Thermal Riflescope in? A. The riflescope comes in one color, Black. Q. What are the colors of the reticles of the RS64 Night Vision Thermal Riflescope? A. The reticles’ colors are white, black, red and green. Q. Does the riflescope come with a case for holding it? A. No, this scope doesn’t come with a carrying case. Q. Does the riflescope come with a lanyard? A. No, the scope does not come with a lanyard. Q. What is the weight of the riflescope? A. The riflescope weighs less than 1.8lb. Q. Does the riflescope come with a warranty? A. Yes, the scope comes with a 2-year standard warranty, which can be extended to 3 years with registration. Q. What are the dimensions of the riflescope? A. This scope measures 8×3.3×2.9 inches. Q. What’s the battery run time of the riflescope? A. The scope’s battery run time is 4 hours. Q. Does the riflescope come with an external power supply cable? A. Yes, it comes with a USB cable and wall charger. Q. What is the frame rate of the riflescope? The scope’s multiple reticles, compatibility with Picatinny rail weapon interface, simple 4-button user interface, active matrix LCD screen, and 3-inch eye relief make it one of the most valuable tools for not only daytime shooters but also nighttime shooters. Also, the scope’s standard 2-year warranty gives you massive cost savings should problems arise with your scope later on. 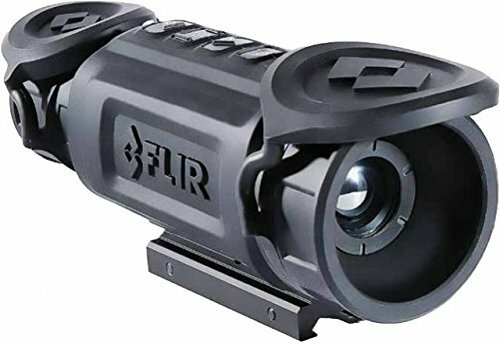 We hope that having read about the FLIR Systems RS64 Night Vision Riflescope and all the useful features it comes with, you can now confidently decide for yourself whether you want this product or not.